This past weekend was St. Patrick’s Day, a festivity that despite having Irish roots, has much more history here in America. It is only since the celebrations in America have taken off, that Ireland is now trying to replicate the Irish pride that is displayed here. Although, I’m not sure why, because it seems it would involve a lot of drunk college students. I digress. Personally, I have a favorite Irish past time that has been mostly forgotten about, despite it’s long history. No, I’m not talking about golf, I’m talking about bike polo. Back in the late 1800s, polo, on horses, was a very popular sport. However, as you are probably aware, having a horse is expensive! It wasn’t only cars that replaced horses in the streets, but bicycles as well. 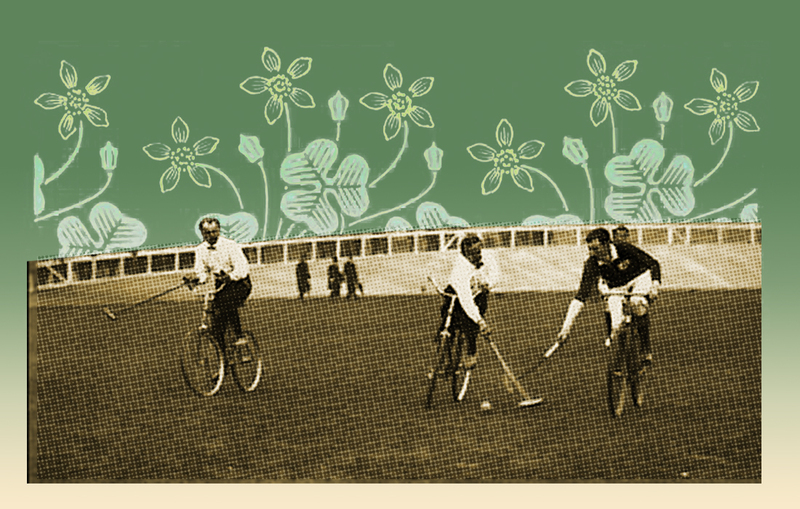 An Irish writer, who worked for Cycling magazine, Richard J. Cready, held the first game of bike polo in 1891. “Polo on Wheels” he called it. This sport took off, and was even said to be generally safe to play. So safe, that in the first bike polo match between Ireland and England, the Irish surprised the English with a woman on one of the teams. The Irish won, and this increased the popularity of the sport among ladies. Her name? Miss Wheeler. How appropriate. The sport became so popular it was exhibited at the 1908 London Games. There were teams popping up everywhere. Clubs came up with their own rules, instructions for the best ways to bespoke (custom fit) your bike for polo play, and price breakdowns for uniforms and safety gear. At some point, the sport lost momentum, but not before even Prince Phillip gave it a try, seen here in 1967, looking very dapper. You can’t touch your feet on the ground, if so, you must tap back in at center court. You must score off the end of the mallet. I quickly got the information of when and where they played, and the following Tuesday found myself in a movie theater parking garage with about eight guys who were super excited to have someone else join. Even in France, there is a club in almost every city. It can be hard to find a good place to play, and with the internet, teams are helping each other. You can find instructions for how to build a court, examples of professional PDFs to submit to your town to secure rights to play on existing courts, and active forums and communities that support this growing sport. There are still groups that play on grass, it is obviously a bit different to play than on the smooth pavement of a hard court. There is some really great, more complete histories of the sport out there, compiled by other enthusiasts, if you are interested in more reading. I look forward to the day where I can turn on the TV and watch a bike polo match, for now, I’ll just have to settle for the live stream during Worlds.